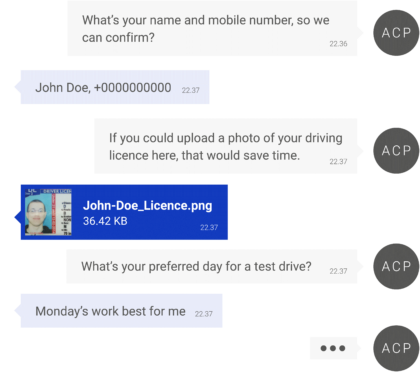 Our Automotive Conversations Platform© makes it easy for your customers to do business with you. By integrating their preferred messaging channels with the business software you already use, we handle all digital contact with your customers. The result is frictionless conversations, high conversion rates and satisfied customers. When customers contact you, they want to know you’re listening. 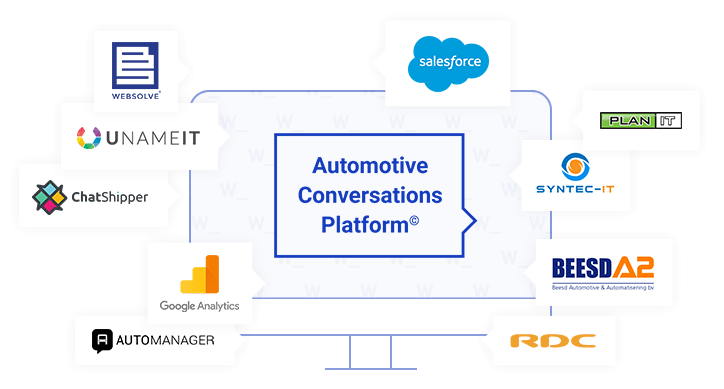 Our Automotive Conversations Platform© delivers seamless conversations across all channels at any time, making your customers feel like valued clients.  Webforms, call back requests, printed invoices, unclear processes. The way companies handle customer contact no longer fits today's ultra-connected world. We make automotive processes better, cheaper and faster by turning them into frictionless digital conversations. Take a look at some real conversations to see what we mean. Our Automotive Conversations Platform© works with the business software you already use, so there’s no laborious installation process. Web1on1 is Europe's leading messaging platform for the automotive industry, serving dealers and brands across the continent.